My breed was developed in Maryland back in the early 1800's. I have an outstanding, well-deserved reputation as an excellent swimmer and retriever in rough water. I have a thick, dense double coat that insulates my body from cold temperatures and it also has the unique quality of shedding water, much like a duck's feathers. I just love people � especially children, and I am proud to say that I have saved many small children from drowning. I much prefer to live where I can be out of doors much of the time and get lots of exercise to stay fit. When fully grown, I am between 21 and 26 inches tall (53.3 to 66 centimeters) and I weigh between 55 and 75 pounds (24.8 to 33.8 kilograms). We have no Chesapeake Bay Retriever Breeders listed at this time. 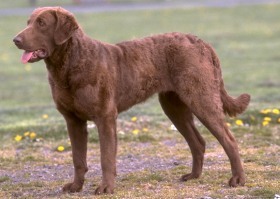 Click here to place your Chesapeake Bay Retriever Ad!